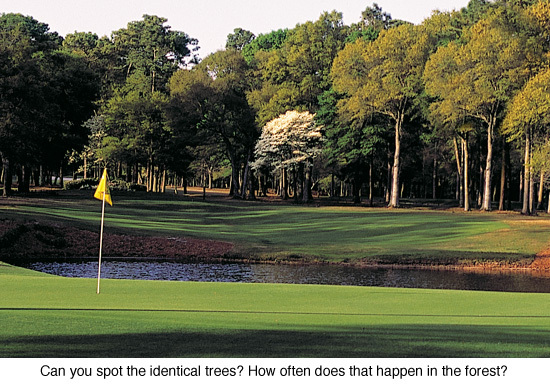 Home > Articles > How Real is that Golf Photo? 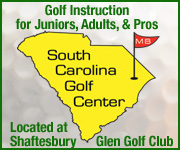 How Real is that Golf Photo? Have you ever looked at a photo of a beautiful golf course and wondered, “Is the course REALLY that perfect?” After all, photos can be faked, right? What about this Photoshop thing we’ve heard about? 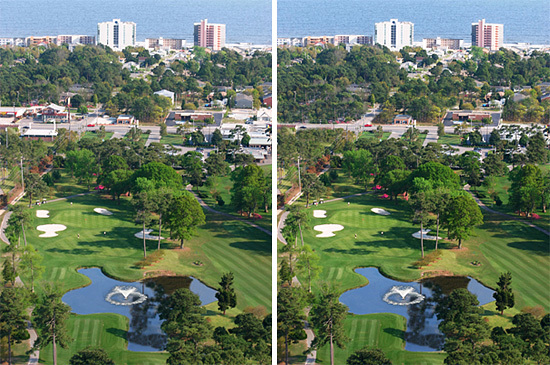 Golf course photo retouching is probably more common than you think. 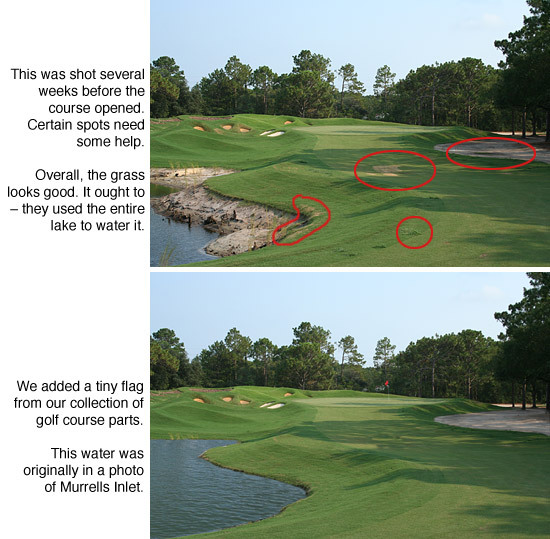 Let’s discuss it a little and see some examples of retouched golf photos. Isn’t this whole thing dishonest? 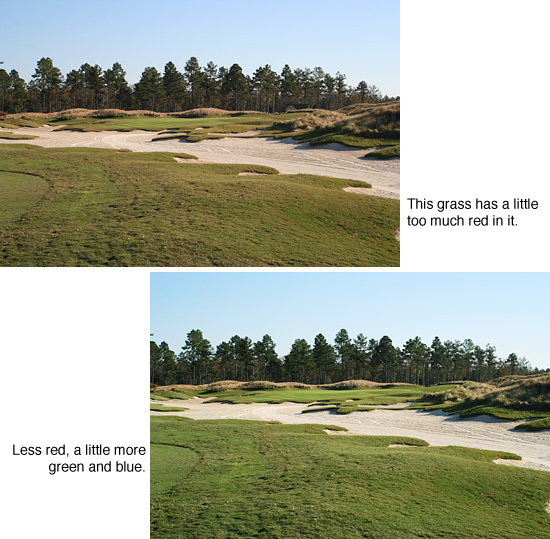 It’s natural for a golf course owner to want to portray his course in the best light, but how far can he go before he is guilty of false advertising? First, understand that all photos need a bit of “adjustment” before they are printed in a magazine or brochure, just to bring them back to looking like the real scene actually appeared when the photo was shot. Film is made with chemicals that have their own color bias, and digital photos need to be adjusted to account for the kind of light that was present when the photo was shot. Usually that adjustment happens automatically using the software built into the camera. When you set your digital camera for “Daylight” or “Cloudy” you are adjusting the software to account for the overall color of the scene. The “Auto” setting allows the camera to make its own judgement. Most times it’s close, sometimes it’s a little off. Sometimes the colors of the photo must be adjusted to account for the ink and paper used in the printing process. 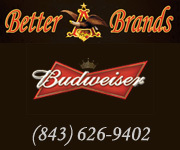 The gold standard in image editing software is Photoshop, made by Adobe Systems. Photoshop allows the experienced user to make changes to photos ranging from minor tweaks in the overall color cast to the complete elimination or addition of any features the photo editor desires. An adjustment in Photoshop called “curves” was used here to make the dark colors darker and the light colors lighter. This makes the whole scene seem sharper and less hazy. Most articles in golf magazines are there to tell a story, not necessarily to present the news. It’s rare that a Golf Digest writer shows up in California, with the assignment to “blow the lid off Pebble Beach.” More likely he is there to tell a story that makes the average golfer want to play Pebble Beach, and nice photos are more likely to make that happen. 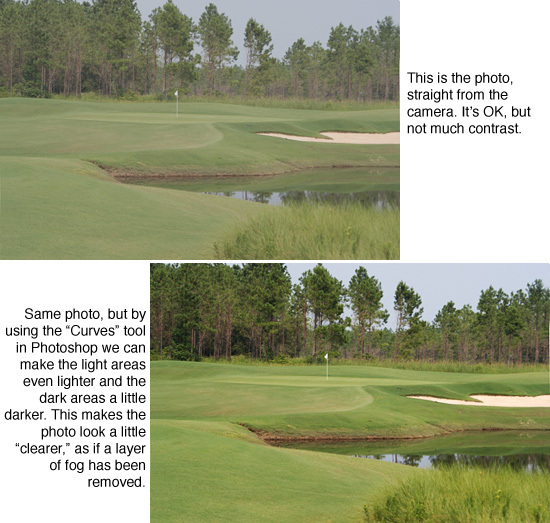 What Makes a Fake Golf Photo? How much adjustment can be done to a photo before it goes over the line into fakery? Are there legitimate reasons for faking a photo? 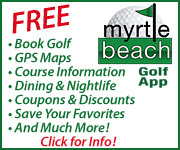 Magazines operate on their deadlines and golf course developers operate on theirs. On The Green may do a story on a new golf course that is scheduled to be open and ready for play in two months, but our deadline is NOW. We know that when the course opens it will be beautiful but right now it has bare spots in the fairway and the greens are a little yellow. It’s normal for us to shoot a photo of the course in its current condition, use Photoshop to fix the bare spots and off-color greens, and go to press. 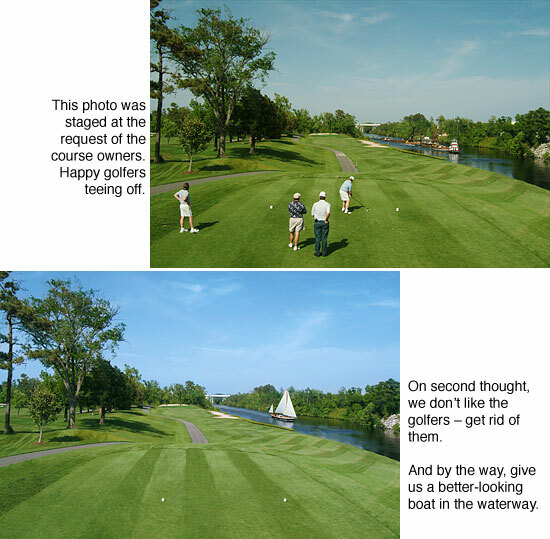 Yes, the photo is greatly enhanced over the reality of the shot when it was taken, but on opening day the course usually looks better than our “fake” photo of it. 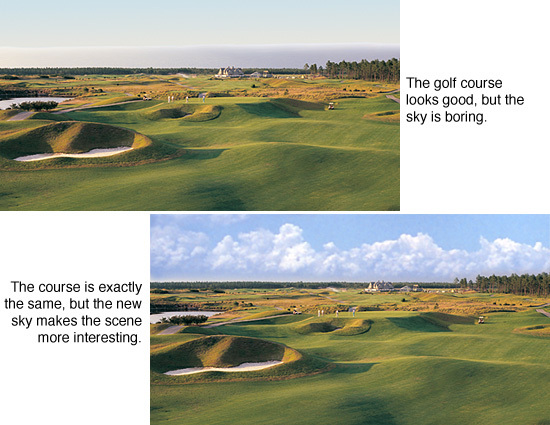 It would be misleading for the magazine to show photos of scraggly fairways and yellow greens, when the course is nothing like that. Sometimes even a normally well-manicured course will have a bad place where the mower took a bounce and scalped a chunk of the fairway. The scalp mark wasn’t there yesterday, and it will be grown-in in two days. Is it fair to publish a photo showing the scalp mark, when that is only a temporary condition? What about enhancing a photo that is already good, just to make it better. To me, it’s OK if the enhancement is something that could happen, but didn’t on the day of the photo. Some photos are great, but the sky is washed out. We can put in a more interesting sky, just to make the photo look better. 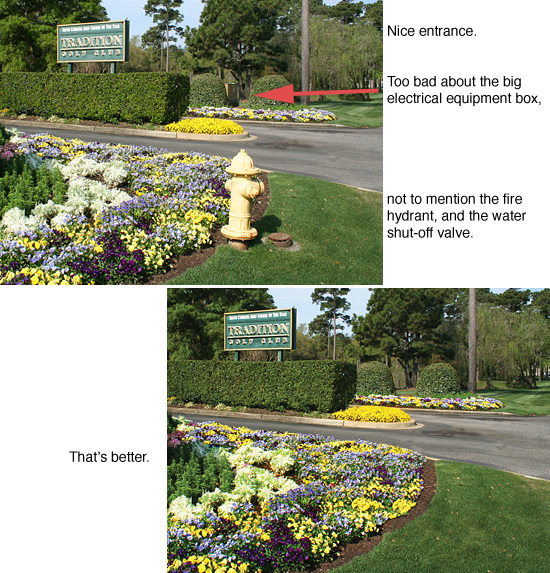 In the photo above, the entrance to the course is great, but reality intrudes with a fire hydrant and an electrical box. You can’t actually erase things without showing a blank place in that spot. Using Photoshop’s “clone tool” we can copy some good features over the offending items. In this photo we copied flowers, dirt, grass, and road on top of the fire hydrant. Sometimes everything is perfect but the light is about to change and the mower in the distance just won’t move. I would take the shot anyway and “erase” the mower later. What if the scene looks great, but the fairway has just been mowed and looks a little yellow? I would green up the grass so that it looks the way it will look a day later in real life. I wouldn’t add a deluxe clubhouse when the real clubhouse is a double-wide mobile trailer, with no plans to replace it. 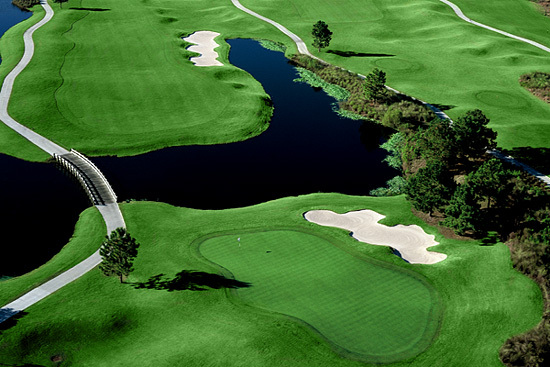 If there are no plans for elaborate landscaping, it would be wrong to add banks of azaleas, a la Augusta National. If it’s not possible, then don’t do it. How can you tell when a photo has been enhanced? Here are two giveaways. Just because grass looks better when it’s green, doesn’t mean that a ridiculous shade of green is better. When you see a golf course where the grass is the color of a lime lollipop, then it has probably been enhanced. Especially if all of the grass is uniformly the same color. In the photo above, even the weeds in the water have been made the same emerald green. Can you spot the two identical trees in the forest? Both are on the right side of the photo. The tree on the left is the original. The one on the right has been copied to hide something. This aerial shows a nice course in town, close to the ocean, but all the buildings and parking lots look too urban and industrial. They need to be toned down a little to keep the mood. Here is a course that had to be photographed before it opened because of our deadline. As you can see, the grass has been fixed, water has been added to the lake, and a flag is on the green. Once the course opened, this spot actually looked much better than the photo. This photo had to shot during a severe drought. The lake on the left had almost been totally drained for irrigation, although by the looks of the original grass it still wasn’t enough. 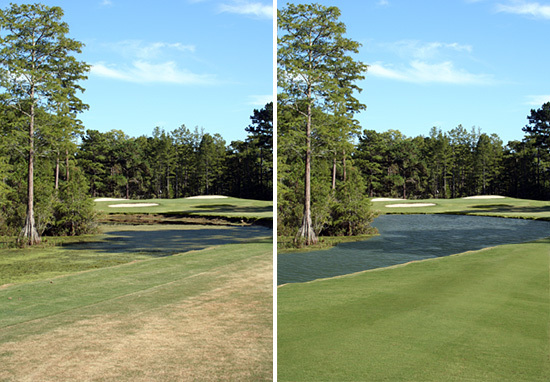 After the drought was over, the course actually looked like the enhanced version on the right. This photo was staged at the request of the course owners. The course was already in good shape the weather was great, and the golfers seemed like a good idea at the time. Afterwards, they changed their minds about the golfers. And they really didn’t like the garbage scow going by. The authors. 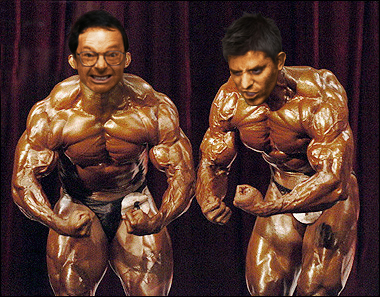 We’re here to “Pump You Up” about photo retouching. 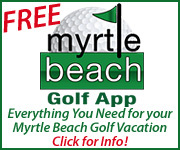 When we’re not on the course, we’re in the gym – seriously!